(CNN) When school is free, you might expect all enthusiastic children to show up, but what if they can't afford the uniform, school equipment and shoes? One entrepreneur and his team are changing the lives of young children in South Africa by providing them with school uniforms, bought with money from sales of his watch company. "Education is the foundation for change anywhere," says Vitae London founder William Adoasi. "You can give aid and other things which are amazing and needed, but when that runs out, there's no more provision for them." Vitae London gives 10% of the money it makes monthly to House of Wells, a charity supporting children in South Africa. "The vision is to support children across the whole of Africa," explains Adoasi. House of Wells plans to go from the most southern African country and work their way up, he said. The son of Ghanaian parents who moved to the UK two years before he was born, 26-year-old Adoasi's father was the first in his family to learn how to read and write. "Education equips people to make the change they want to see. I saw the impact it had on my dad's life." Adoasi, a former insurance broker, had the idea for Vitae London in December 2014. "I always had this dissatisfaction working for others. I always knew deep down that I had to do something of my own." After designing his pieces, Adoasi made sure the company's charitable ethos extended all the way through the production process. He chose factories with high ethical standards because "the last thing I wanted to do was support children through education in South Africa, but have children producing the watches." Launching in November 2015 -- with the help of his "very understanding" wife -- was a risk. "I launched with my own money, my wife and I had saved up (around 8,000) towards a house deposit, and I managed to persuade her to allow me to quit my job and use that money to start the business." 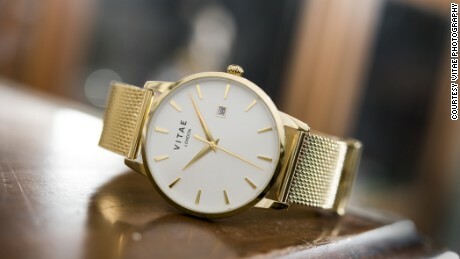 Just 11 months in, Vitae London has sold 412 watches with a turnover of 52,180, and purchased 780 items of school uniform for children in South Africa. The watches are sold online and at Boxpark in London, and at Le Tresor in Johannesburg, ranging in price from 145 ($177) to 165 ($201). Adoasi's advice for those wanting to start their own passion projects? "Do everything you do with a spirit of excellence," he says. "If your product is just as good, if not better than the those already in the market, and you have got a unique selling point, then there's no reason it won't succeed." After launching, Vitae London received a 20,000 ($24,500) loan from Virgin StartUp, the not-for-profit arm of Virgin, dedicated to helping aspiring entrepreneurs. Soon after, Adoasi was chosen out of 1,000 loan recipients to be an ambassador for entrepreneurship in the UK. "I went to Richard Branson's house a couple of months ago, there was a mini-workshop about branding, then he (Branson) got involved and gave his two pence, asked us questions about our business and encouraged us -- it was humbling to meet him." The English business magnate encouraged the start up founders to be the face of their brands and allow customers to connect with the story behind the business, something Adoasi was not initially keen on. "I thought if people saw it was a young black guy from South London running this business, would they think it's reputable, but would they want to buy into it?" "[Branson] spoke about the importance of having the story and the face behind the brand pushed, because that's what makes you stand out, that's what gives your brand the soul." Social media has been a key factor in the growth of Vitae London. "In this day and age, social media is almost everything, if you went back 50 years ago, I would have no chance of starting a watch brand in the UK and seeing it thrive." Something else that has not done the brand any harm are multiple celebrity endorsements. "They've been crucial in terms of giving us credibility," Adoasi says of his celebrity fans, which include singers Emeli Sande and Paloma Faith. "Because of those endorsements people just assume we've been around for a while," admits the entrepreneur. Adoasi is currently working on an exhibition to showcase the stories of the children Vitae London has helped, to celebrate the brand's first year in business.